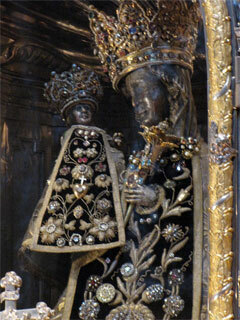 On Sunday, September 27, 2009, in the town of Altoiting (Germany), the eparchial pilgrimage to the miraculous statue of the Mother of God “Black Madonna” took place. The hierarchical Divine Liturgy in the Church of Saint Conrad was led by the Reverend Bishop Peter (Kryk), in concelebration of fathers: Bohdan Pidlisetskyj, Lyubomyr Fedorak, Andrey Dmytryk, Fr. Mykola Hornykevych from Austria, and Deacon Otto. The Pokrov Choir, lead by of Stanislav Chuenka, sang at the Mass. In the sermon Bishop Peter greeted all the pilgrims who arrived not only from Munich and surrounding villages but also from Austria and Australia. In regards to the Jubilee of 50th anniversary of the Eparchy in Germany and Scandinavia, the bishop said in particular, it includes 12 parishes to which belong newly arrived Ukrainians. Besides, he thanked all those who helped in the Church’s civil work throughout the year and said that "the German pastors and guests who were present at the Jubilee celebrations on September 18-20 were impressioned.” He also wished further development and growth to the Eparchy. After the prayer service a ceremonial procession was led by the bishop with the clergy to the chapel, where the miraculous black statue of the “Black Madonna” is located. The prayer service before Maria’s Chapel was sung by the all those present, under the lead of Stanislav Chuenk and singers of the Pokrov choir. Some say that the statue became black from the smoke of millions of candles, which burned there throughout the years. Another legend has it that there was once a fire in the town and all was burned down except for the statue of the Mother of God, which became black. Consequently the city was rebuilt, and around the chapel appeared new larger and smaller churches, and the Basilica. In 1984, in the Basilica, a memorial sculpture of Pope John Paul II was unveiled, which was done by the Ukrainian artist Leonid Molodozhanyn from Canada. The Bavarian town of Altötting is Germany’s most significant pilgrimage site for the veneration of St. Mary. Pope Benedict XVI will celebrate his second mass in Germany during his visit to Bavaria here on Monday. Located just a few miles from the German-Austrian border, Bavarian dukes held court in Altötting as far back as 748. But the town really gained larger significance after the year 1489, when a miracle was reported in a local church. According to legend, a three-year-old boy had drowned in a nearby creek and was placed on the church altar by his desperate mother, who began praying fort he child’s life with other worshippers. The boy’s alleged miraculous resurrection laid the foundation for centuries of pilgrimages to the town. Those who received help from St. Mary placed votive tables made from wood and depicting the miracle outside the Chapel of Grace that is now surrounded by several churches and basilicas in the center of town. Together with Mariazell in Austria, Czestochowa in Poland, Fatima in Portugal, Loreto in Italy and Lourdes in France, Altötting forms the cooperation "Shrines of Europe." Benedict XVI will be the third pope to visit Altötting, which is also called the "Heart of Bavaria." His predecessor, Pope John Paul II, came in 1980 and the first pontiff to make the pilgrimage was Pius VI in 1782. Born in the nearby village of Marktl, which the Benedict will also briefly visit later on Monday, the pope has strong ties to Altötting – apart from the fact that his older brother, Georg, was born there. He has been to the town on numerous occasions.